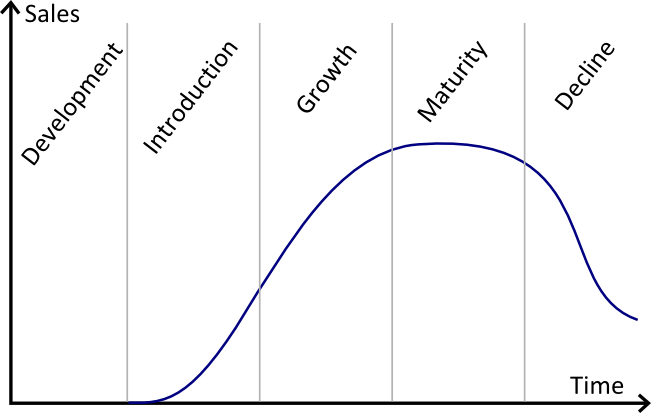 The life-cycle represents the various market stages - namely development, introduction, growth, matury and decline - that occur for the vast majority of consumer packaged goods. From the inventory management viewpoint, the product lifecycle is one of the major demand pattern along with seasonality or trend that needs to be accounted for in order to maintain the desired service levels. Introduction where there is only a limited awareness of the market for the product. Growth as more prospects turn customers as they discover the product. At this point, competitors enter the market, and ultimately limit the growth. Maturity is reached when the growth is halted but the sales remain steady because a market balance is found between the product and its competitors. Decline happens as later, more competitive products gradually erodes the sales. The decline can be accelerated if the product is actively phased out of the market. Classic analysis is inclined toward profitability analysis tailored for the manufacturing perspective: the short-term monopoly obtained during the introduction phase is leveraged to generate extra-profits that cover developpement costs. This is a practical example of the creative destruction theory of Joseph Schumpeter. For many FMCG (fast moving consumer goods) producers, the product lifecycle is not driven by the competition, but by the producer itself who keeps pushing new products to the market (possibly bringing only superficial change to the product). New products quickly cannibalize the sales of the older products. The same phenomenon is observed in other fast paced markets such as consumer electronics. From an inventory viewpoint, cannibalizations are more favorable, because the company has a lot more information about it own future product launches as opposed to product launches operated by competitors. Also, newly launched products are typically close to perfect substitute to the old ones, which strengthens the product lifecyle pattern. The life-cycle of entertainment products such as books, CD, DVD, video games follow a very specific pattern that does not entirely fit the classic life-cycle vision. For such products, market awareness is typically built upfront, even before the sales start. Then, sales are the strongest at launch, and quickly decline afterward. 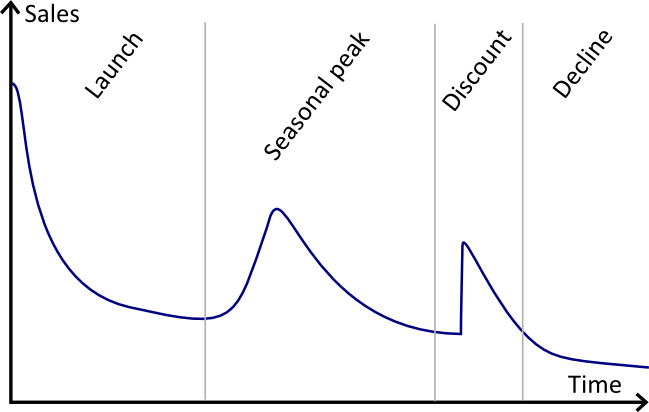 a first seasonal peak (Christmas). a second peak caused by a significant price discount. Afterward, the product sales typically only decline further, and subsequent seasonal peaks are typically negligible compared to the first. This type of life-cycle patterns lead to very counterintuitive situations where a business can be booming, while the sum of its forecasts indicate a strong downward trend. All products undergo a market lifecyle, but it does not mean that lifecycle is of primary importance as far inventory optimization is concerned. If the lifecycle is very long compared to the lead time, then the impact of the lifecycle, at inventory level, might be dwarfed by other patterns, such as the day of the week cyclicity for example. Forecasting the life-cycle of outstanding products is very difficult, and typically not possible with a pure statistical approach. However, such outstanding products are rare (for example the Microsoft Kinect holding the record of the fastest selling consumer electronic device). The vast majority of products are far from being one of a kind. As a result, the best way to quantitatively assess the shape of the demand lifecycle consists of establishing a set of closely relevant products found among the records of the company. The analysis of life-cycle patterns is particularly tedious - when done manually - because one has to find a set a relevant products for each product being launched. However, the forecasting technology of Lokad auto-detects such similarities, primarily by leveraging tags that are used to decribe products. This approach allows Lokad to deliver fully automated forecasts that leverage life-cycle patterns.